If you're having trouble turning your device on, first try holding down the silver power button for five seconds. There is a delay on the power button to prevent the device from turning on accidentally. This means that quickly pressing the button may not activate AIRE. After holding the power button down for at least five seconds, check to see if the lights on the front of the device have begun to light up. Also check for a blue flashing light on the bottom device. Wait 30 seconds to see if any of the lights on the front turn on. These come on in stages as the device warms up, so if the first set isn't working it may take time to see the second set light up. If the device didn't turn on, use the cord in the box to charge it. 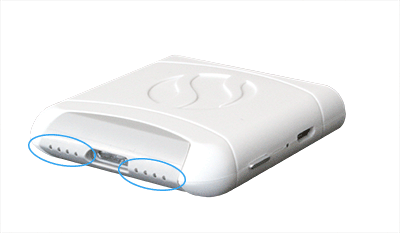 Ensure the charger is fully inserted into the port on your AIRE. When the device is charging, the light on the side, next to the power button, will start off red. It will turn green when the device is fully charged. After charging, hold down the power button for five seconds. Release the button and wait 30 seconds, then check the lights on the front and bottom of the device to see if any have lit up. Lights mean the device is powered on and warming up. If your device still won't turn on, try charging it with a different USB cable, as these can sometimes stop working. While the device is still plugged in and charging, try holding down the power button for five seconds. Check for lights as you did before. If your device still won't turn on after trying these steps, please contact us at help@foodmarble.com.